To say that RF can be an issue in some venues was the understatement of the year while I was recently freelancing at the F1 Grand Prix on behalf of UK based production company ‘MerlinPA.’ And in the middle of a sea of RF the Invisible Waves X RF Command Center (from Kaltman Creations... RFAnalyzers.com) got quite an extended workout. We were providing the audio and production for the main stage at the event. We had 3rd party presenters, pit crew and team radios to avoid, DTV and screen broadcast feeds, and the BBC working alongside us for live global broadcast. We also had site radio comms systems and lastly (but most importantly for us) we had our stage wireless RF, mics, IEM’s and various musicians’ wireless systems. The challenge was to ensure the low power wireless devices worked in the vicinity of some very high power broadcast systems, such as the remote relay station that you see on camera shots every so often, i.e. the guy wearing the backpack with the big aerials. He’s is like a roaming RF nightmare when he stands near your gear with his transmitters of doom! Upon the arrival of each new piece of RF I would take note of its frequency and create a Master Panel for it on the IWxLive RF Command Center so I could see on-screen how much power it was generating. Within the spectrum window I could also note if there would be a problem for any other localized frequencies. Intermodulation is not as huge of a problem as some people make it out, especially when the transmitters are spaced so far apart as in this scenario. I was more concerned with frequency clashes. The good thing about having this software running in the background is that it takes ALL of the guesswork out of doing frequencies. I simply arrived on-site and popped my laptop on a spare riser backstage, out of the way, and started it running. I didn’t need power as it has a battery-pack, meaning that I could be totally wireless as long as I had a charge. My Macbook (yes, I run the windows-based software perfectly well within Parallels) and the IWX system will run for around 5 hours on the batteries. I believe this is more than enough time to make the battery pack an essential purchase alongside of the main scanner. I arrived and started scanning my ‘area of focus’ (700-870mhz). Here in the UK this is the usual bandwidth to scan for entertainment purposes. The IWxLive system will scan a huge bandwidth if needed, 1KHz – 1.8GHz…and can even go up to 3.5ghz if you have the IWxAV unit. I noted all the important frequencies first and did a scan with everything switched off; then you can see what background RF already exists. I popped some custom markers on the spectrum display so I could see what’s happening at a glance. I marked specific areas to avoid DTV signals, and on this show I marked the BBC high power frequencies also. We did adapt our IWX system slightly. It ships with a mini-jack which, when connected to a laptop input, enables you to hear or monitor a particular frequency. However the signal was low, so we put an XLR connector on instead so the signal is 30dB louder and it is easily patched into a console for quick PFL if needed. This is a worthy modification for those who want to listen in! There were a couple of times during set up when this feature was handy, such as checking that frequencies were clear of interference prior to the receivers being patched into the stage-box. I could simply listen in and advise if a frequency needed to be adjusted. And several did need to be moved. Just recently I had another RF nightmare with Kool and the Gang at Newmarket Racecourse, where horse racing, Live broadcast and stage entertainment are locked in a constant RF battle for supremacy. We had over 45 radio systems on this show and the IWX system made setup so much easier than relying on ‘scan and sync’ technology. Never again will I ever scan and sync via a mic or IEM system’s on-board facility. You simply don’t know what frequencies are around you that could be dynamically changing. It is akin to walking around blindfolded in a dark room, praying you don’t trip over a walking cat! They might be quick to set up, but how do you know if the DTV station has momentarily lost output power to its transmitter and is about to come back online? Or what if the BBC backpack man is about to switch to his other frequency without warning…or simply that there is an intermittent intermodulation spike at your chosen frequency? You can’t know which is why the IWx RF Command Center takes out all of the guesswork! 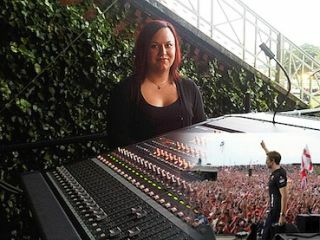 Samantha Graham has been a professional audio engineer for 14 years and has worked alongside such performers as Mariah Carey, Beyonce Knowles, Whitney Houston and Natalie Cole.